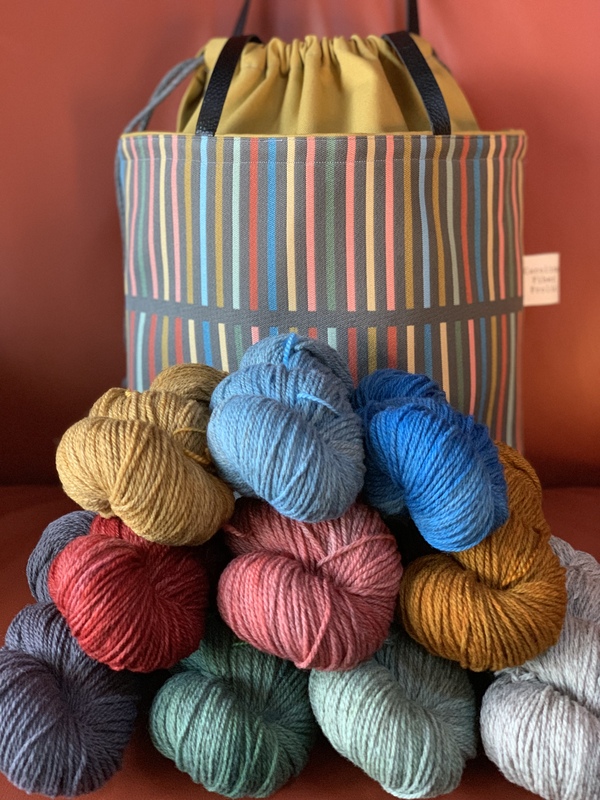 Our friend Sarah of The Copper Corgi is hand dyeing yarns that coordinate with the colors of the bag fabric. Aren’t they gorgeous??? This custom milled DK weight yarn in 10 colors will be available at the March 15-17 retreat, as well as natural color roving. Registration are being accepted – links to the class descriptions and registration form are in the right hand side bar. Hope to see you at the 10th Anniversary Carolina Fiber Frolic Retreat!! Carolina Fiber Frolic 10th Anniversary!! The March 15-17, 2019 Carolina Fiber Frolic Retreat will be the 10th annual spring retreat!! We’re working hard to make it extra special & hope you’ll be able to come! Information on the classes that will be offered at the 9th Annual Spring Carolina Fiber Frolic Retreat is now available and Registration is Open! There are a dozen classes from which to choose: Spinning, Knitting, Nuno Felting, Saori Style Weaving on a Rigid Heddle Loom, Fleece Prep, Steeking, Armenian Style Knitting, Fractal Spinning, and More! Click Here to read about the classes, instructors, and Frequently Asked Questions. After reading through the info, feel free to E-mail me at jan@carolinafiberfrolic.com if you have any questions. Hope to see you at the Spring 2018 Carolina Fiber Frolic Retreat in the Mountains of North Carolina! Here’s a quick photo of the Carolina Fiber Frolic March 2017 project bags that are available for preorder! If you are already signed up for the retreat, you will receive an e-mail with more details. If you’re not already signed up, what’s stopping you? These lovely bags will be available (only as a pre-order) in 2 sizes: a Large “sweater size”, and also an X-Large size for larger sweaters, multiple projects, or blankets. Details on the retreat classes, etc. as well as the registration form are linked in the right hand side bar. Hope to see you in the North Carolina Mountains for the 8th Annual Carolina Fiber Frolic Retreat! Registration is open for the 8th Annual Carolina Fiber Frolic Retreat while will be held March 24-26, 2017 in Sapphire, North Carolina. With over a dozen classes to choose from, you have the opportunity to enjoy a weekend in the mountains with other fiber lovers, learn a new fiber skill or build on those you already enjoy! Class topics include Seven Different Ways to Knit, Shetland Hap Shawls, Natural Dyeing a Rainbow Pot, Making the Most of Hand-Dyed Yarns, making your own Felted Journal, and many more! Click the link in the side bar to learn about all of the class selections, read about the instructors and more information on the Carolina Fiber Frolic Retreat. Once you’ve chosen your classes, the Registration Form is also linked for you to download and either mail or e-mail in to reserve your spot at the next Frolic in the Mountains. Hope to see you there! Its time! Registration for the November 11-13, 2016 retreat is now open. If you are on the email list, you should have received registration information. The same information will also be linked in the right-hand side bar for those who are new to the Carolina Fiber Frolic. Below are some photos of the Limited Edition Fall 2016 project bags that are available as a preorder on the registration form. If you are familiar with my typical sweater size project bag, note that these are slightly larger at approximately 17″ wide, 12″ high, and 5″ deep at the base. Hope you’ll be able to join the Frolic in the mountains this fall!